Telford Ice Rink will be having a very special visitor again this year….Santa Claus is coming to town! 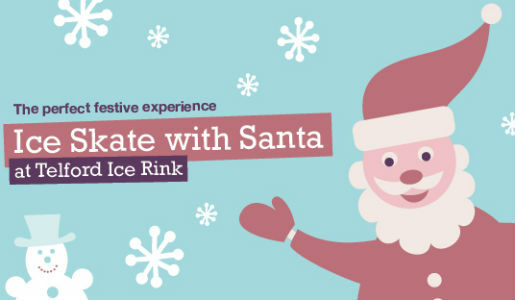 Returning to Telford Ice Rink for the second year, the very popular Santa Skate sessions start this Saturday and will be taking place throughout December allowing youngsters not only to meet Santa, but have the opportunity to skate around the ice with the big man himself. This most anticipated festive visitor of the year will be making his first appearance at Telford Ice Rink this Saturday, 3 December. It’s an experience like no other and to remember the special moments a photographer will be on hand to capture the magical memories. A resident DJ will be present for the Santa Skate sessions playing festive and current chart music to truly bring the Christmas spirit to the ice rink. Councillor Richard Overton, cabinet member for Housing, Leisure and Health, said: “Santa Skate was such a popular event last year that this year we have brought it back and put additional sessions on to allow lots more young people to meet and skate with Santa and make some magical memories.